Stop by and meet the new guy, Greg! He comes to us with over 20 years of experience. Celebrating 50 years of exceptional service to Highland Heights and the surrounding areas! Bud's Pure Oil was opened Friday March 13, 1965. It was with one grease rack and a wash bay that our business got it's start. The community began having their cars serviced here, and many of the relationships fostered back in those days carry forward to the present. 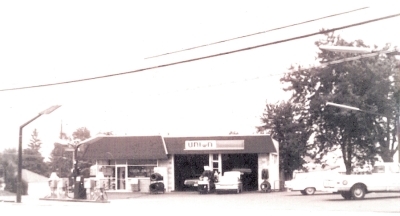 A few years later the shop was renamed Bud's Union 76. We had a new name, but our mission was still the same, to serve the community as if they were family, just as we always had. With two new service bays added in 1985, Jeff and his business partner Mike purchased the company from Bud in 1989. The company had a new name and had become a second generation company. Renamed Bud's J&M Service, Inc. the company continued on in the family tradition, providing the quality service that was part of each and every customer experience. When Mike left the business a few years later to pursue other things, Jeff ran the company and handled day to day operations. His wife Vicki joined the team, as well as his sons who were growing up and ready at the gate to enter the job as service technicians. Bud was there to help Jeff mold his sons into outstanding mechanics in their own right. It was truly a family affair, and a family commitment to our customers that delivered us to the present. Today, fifty years later, Bud still works part time, along with Jeff, Jeff's wife, and their son AJ. To support the community's needs, we've expanded our ability to service the community with two full time employees and two part timers, who aren't related but think they are. Three generations working side by side satisfying the needs of the community and servicing their vehicles. We can work on your car, domestic, import or classic.